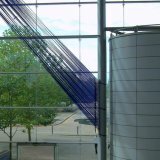 SOUNDING (out of the blue) is a site-specific installation in response to the architecture of Midsummer-Place in Milton Keynes. The building features a roof which is 20 metres high and shaped like a wave. Daylight enters through five skylights of about 5m x 20m and through the two glass façades towards Midsummer Boulevard. 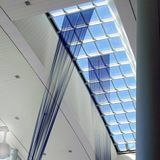 Sounding relates to the height of Midsummer Place and to the way light illuminates the concourse. 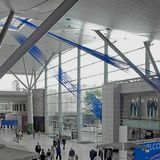 Near the west entrance two blue bands connect one of the skylights with two roof supports near the ground. Each band is one fathom wide, the distance between the fingertips of your outstretched arms. 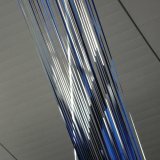 The bands are made of 36 ribbons which twist slightly while travelling across the space. 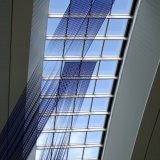 Consisting of royal-blue grosgrain ribbons, Sounding captures and reflects the ambient light. The shade, shape and transparency of the piece change with the onlooker's position. The wave-shaped roof suggests a maritime approach to the building: out of the blue, Sounding 'fathoms' the height (or depth?) of the concourse. 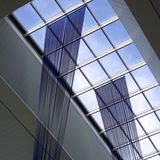 Sounding adds the human scale of one fathom to the vast space of Midsummer Place thus ‘putting it into perspective’.